Former England cricket captain Michael Vaughan believes Australia captain Ricky Ponting will lose his job if he fails to secure an Ashes victory this winter. England have arrived Down Under to defend the urn they claimed with a 2-1 success on home soil last year. Australia have not lost an Ashes series Down Under since 1986/87, but have been struggling in recent months and suffered a 2-0 Test whitewash on their recent tour of India, placing Ponting's leadership under increasing scrutiny. 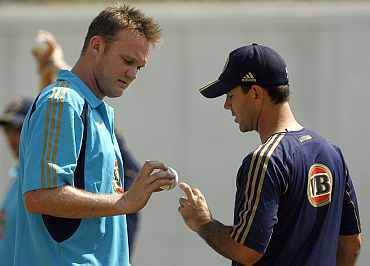 "If he loses the series he will go," Sky Sports predicted ex-England skipper Vaughan, who came out on top in his captaincy battle with Ponting in the 2005 Ashes. "He has lost the Ashes twice (2005 and 2009) and hasn''t won an Ashes in England either," he added. "His record in Australia is phenomenal, but he will have to be at his best, both as a captain and as a batsman to put England under pressure," Vaughan said. Vaughan also feels England will benefit from the absence of a number of Australian Ashes veterans, who have recently retired. 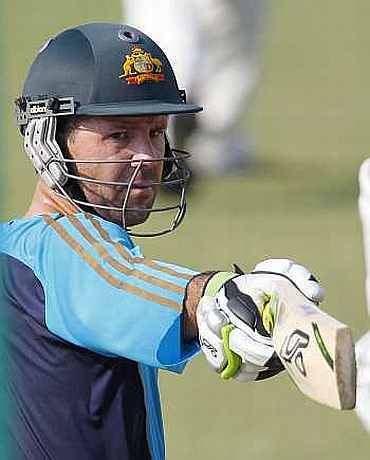 "He (Ponting) doesn't have the X-factor bowlers who can change games. That puts your batsmen under a lot more pressure because they know that you have to get lots more runs to give your bowlers something to bowl at," he said. "If they'd have got 300 a few years ago, they knew that Warne and McGrath would get them back in the game but now they need 400 plus to really put England under pressure," he added. Vaughan is optimistic about England's chances but warned they must hit the ground running in the series opener in Brisbane, starting on November 25. "They can win it," said the 36-year-old, who scored three centuries Down Under in the 2002-03 series.